As I had mentioned in my earlier post, because of the small portion sizes at Hapa Izakaya, the boys were still quite hungry at the end. 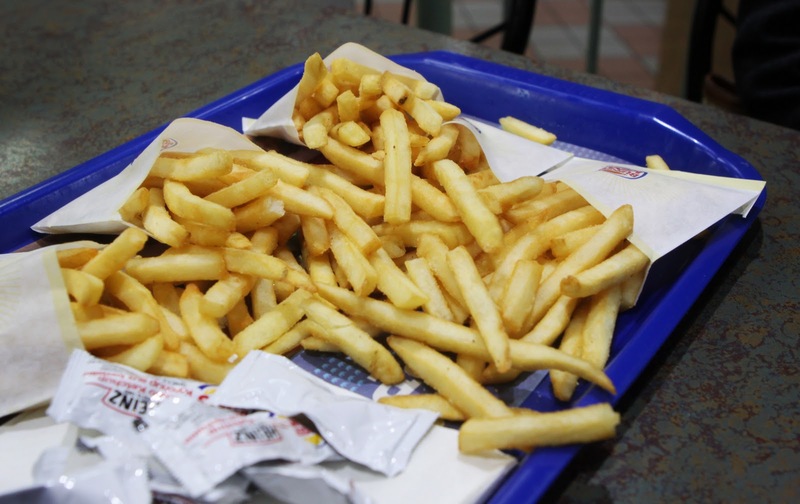 We had heard that Burger King had recently revamped their fries, making them thicker (thicker than a No. 2 pencil according to the Americans) and have 20% less sodium compared to previously. We were eager to see how these fries matched up against the competitors. Plus, they were offering free small fries that day. We had already paid a premium price for our dinner (more than our usual dinners anyhow), so off we went to Burger King on Main St. and 1st Ave. It was already fairly late in the evening, so there weren't too many diners at this particular location. Turtle and Wei-Gor said they thought they saw a certain type of suspicious rodent sprint across the parking lot...but we tried to not think too much of it... We approached the counter and ordered 5 small fries. No surprised reaction from the sales rep...a good sign. I just got a FREE BURGER KING GIFTCARD, this promotion is open for everyone, VISIT THIS SITE to participate and claim your free giftcard.